Back of the Cereal Box: Who — Not Whither — Is the Blue-Haired One? Some people make life a little tougher than it is. And they do this by being confusing. Of course, the fact that certain people speak different languages doesn’t help, either. nonetheless have four names between them. The intentional obscuration is completely undone, however, with the release of a true Chrono Trigger sequel, Chrono Cross, a few more years down the line. One of the 45 playable characters in it is a guy named “Guile” who bears enough of a resemblance to Magus that it seems more than coincidental. (He also looks like an extra from the ballroom scene in Labyrinth, but that is neither here nor there, as this post is concerned.) Also, the linguistic distance between “Gil” and “Guile” seems negligible. The matter is compounded by the fact that Guile has a different name in Japan: “Alf.” Associations with extraterrestrial-starring sitcoms aside, the name is notable because Chrono Trigger’s Janus has a pet cat, Alfador. Again, the names resemble each other enough that I’d guess the similarity is not a coincidence. Thus, what may or may not be the same character in three different games has eight different names. (As far as I’m concerned, the jury is still out on whether Guile is supposed to be Magus or just someone who looks a lot like Magus.) I’m not sure whether I love or hate the fact that such a seemingly simple matter could be so very complicated. Thank you. That was an enjoyable read. ... Thanks? Though I must admit that this post wasn't intended as comedy. 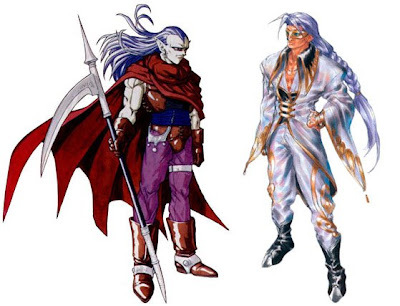 Guile was, at one point, planned to be revealed as Magus during the storyline. They eventually decided against that and dropped the connection, but the character design (and the name, to an extent) still reflect the once-intended connection. After Magus goes back to 12,000 BC, he takes the identity "The Prophet". You knew this, of course, but I think it's worth mentioning. In Radical Dreamers, in one of the non-canon endings, his name is equally non-canonically revealed to be Gilbert. 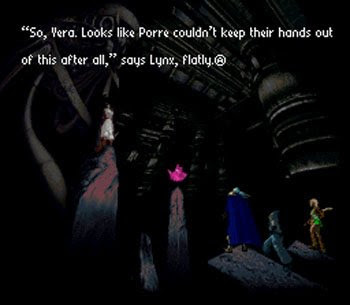 In the remake of Chrono Trigger for the DS, Magus is called "Fiendlord." you fight the Time Devourer. This is where Schala has been infused with Lavos or something or other. After some dialogue, Schala tells Magus he can't save her and to continue on. He freaks out a bit. After the battle the screen goes black and he says some things that he will continue his mission no matter what (not in those exact words). The next scene shows Janus in a forest. He has suffered from amnesia. He is unsure of what it is, but he knows he must do something. And with a whoosh of his cape he sets off on his quest. This suggests that he lost his memory, and over time became Guile. I'm taking the connection Square is giving and saying Guile is indeed Janus.